Client View – The client view represents a virtual layer that provides access to the underlying partitioned data. Access to this tier is provided using the NamedCache interface. In this layer you can also create synthetic data structures such as NearCache or ContinuousQueryCache. Storage Manager – The storage manager is the server-side tier that is responsible for processing cache-related requests from the client tier. It manages the data structures that hold the actual cache data (primary and backup copies) and information about locks, event listeners, map triggers, and son. 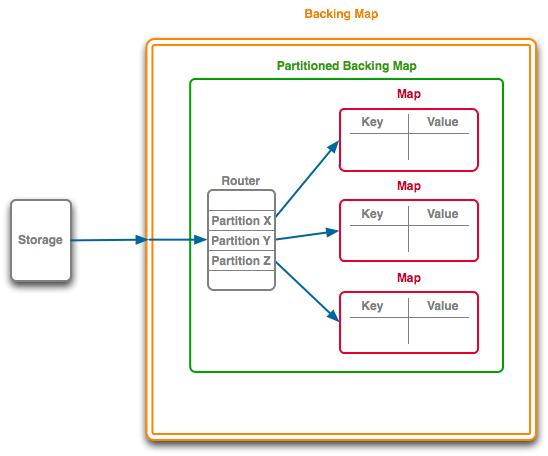 Backing Map – The Backing Map is the server-side data structure that holds actual data. Coherence allows users to configure some out-of-the-box backing map implementations and custom ones. Basically, the only constraint that all these Map implementation have to be aware of, is the understanding that the Storage Manager provides all keys and values in internal (Binary) format. To deal with conversions of that internal data to and from an Object format, the Storage Manager can supply Backing Map implementations with a BackingMapManagerContext reference. Figure 13-1 shows a conceptual view of backing maps. 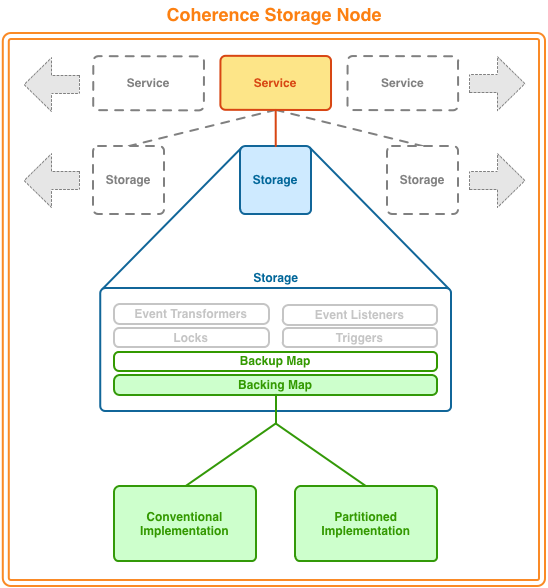 Local storage refers to the data structures that actually store or cache the data that is managed by Coherence. For an object to provide local storage, it must support the same standard collections interface, java.util.Map. 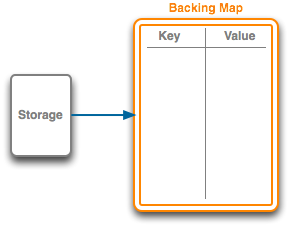 When a local storage implementation is used by Coherence to store replicated or distributed data, it is called a backing map because Coherence is actually backed by that local storage implementation. The other common uses of local storage is in front of a distributed cache and as a backup behind the distributed cache. Safe HashMap: This is the default lossless implementation. A lossless implementation is one, like Java's Hashtable class, that is neither size-limited nor auto-expiring. In other words, it is an implementation that never evicts ("loses") cache items on its own. This particular HashMap implementation is optimized for extremely high thread-level concurrency. For the default implementation, use class com.tangosol.util.SafeHashMap; when an implementation is required that provides cache events, use com.tangosol.util.ObservableHashMap. These implementations are thread-safe. Local Cache: This is the default size-limiting and auto-expiring implementation. The local cache is covered in more detail below, but the primary points to remember about it are that it can limit the size of the cache, and it can automatically expire cache items after a certain period. For the default implementation, use com.tangosol.net.cache.LocalCache; this implementation is thread safe and supports cache events, com.tangosol.net.CacheLoader, CacheStore and configurable/pluggable eviction policies. Read/Write Backing Map: This is the default backing map implementation for caches that load from a database on a cache miss. It can be configured as a read-only cache (consumer model) or as either a write-through or a write-behind cache (for the consumer/producer model). The write-through and write-behind modes are intended only for use with the distributed cache service. If used with a near cache and the near cache must be kept synchronous with the distributed cache, it is possible to combine the use of this backing map with a Seppuku-based near cache (for near cache invalidation purposes). For the default implementation, use class com.tangosol.net.cache.ReadWriteBackingMap. Binary Map (Java NIO): This is a backing map implementation that can store its information in memory but outside of the Java heap, or even in memory-mapped files, which means that it does not affect the Java heap size and the related JVM garbage-collection performance that can be responsible for application pauses. This implementation is also available for distributed cache backups, which is particularly useful for read-mostly and read-only caches that require backup for high availability purposes, because it means that the backup does not affect the Java heap size yet it is immediately available in case of failover. Serialization Map: This is a backing map implementation that translates its data to a form that can be stored on disk, referred to as a serialized form. It requires a separate com.tangosol.io.BinaryStore object into which it stores the serialized form of the data; usually, this is the built-in LH disk store implementation, but the Serialization Map supports any custom implementation of BinaryStore. For the default implementation of Serialization Map, use com.tangosol.net.cache.SerializationMap. Serialization Cache: This is an extension of the SerializationMap that supports an LRU eviction policy. For example, a serialization cache can limit the size of disk files. For the default implementation of Serialization Cache, use com.tangosol.net.cache.SerializationCache. Overflow Map: An overflow map does not actually provide storage, but it deserves mention in this section because it can combine two local storage implementations so that when the first one fills up, it overflows into the second. For the default implementation of OverflowMap, use com.tangosol.net.cache.OverflowMap. Natural access and update operations caused by the application usage. For example, NamedCache.get() call naturally causes a Map.get() call on a corresponding Backing Map; the NamedCache.invoke() call may cause a sequence of Map.get() followed by the Map.put(); the NamedCache.keySet(filter) call may cause an Map.entrySet().iterator() loop, and so on. Remove operations caused by the time-based expiry or the size-based eviction. For example, a NamedCache.get() or NamedCache.size() call from the client tier could cause a Map.remove() call due to an entry expiry timeout; or NamedCache.put() call causing some Map.remove() calls (for different keys) caused by the total amount data in a backing map reaching the configured high water-mark value. Synthetic access and updates caused by the partition distribution (which in turn could be caused by cluster nodes fail over or fail back). In this case, without any application tier call, some entries could be inserted or removed from the backing map. Keeping data in memory naturally provides dramatically smaller access and update latencies and is most commonly used. More often than not, applications must ensure that the total amount of data placed into the data grid does not exceed some predetermined amount of memory. It could be done either directly by the application tier logic or automatically using size- or expiry-based eviction. Quite naturally, the total amount of data held in a Coherence cache equals the sum of data volume in all corresponding backing maps (one per each cluster node that runs the corresponding partitioned cache service in a storage enabled mode). The backing map above is an instance of com.tangosol.net.cache.LocalCache and does not have any pre-determined size constraints and has to be controlled explicitly. Failure to do so could cause the JVM to go out-of-memory. This backing map above is also a com.tangosol.net.cache.LocalCache and has a capacity limit of 100MB. As the total amount of data held by this backing map exceeds that high watermark, some entries are removed from the backing map, bringing the volume down to the low watermark value (<low-units> configuration element, witch defaults to 75% of the <high-units>). The choice of the removed entries is based on the LRU (Least Recently Used) eviction policy. Other options are LFU (Least Frequently Used) and Hybrid (a combination of the LRU and LFU). The value of <high-units> is limited to 2GB. To overcome that limitation (but maintain backward compatibility) Coherence uses the <unit-factor> element. For example, the <high-units> value of 8192 with a <unit-factor> of 1048576 results in a high watermark value of 8GB. The backing map above automatically evicts any entries that have not been updated for more than an hour. Note, that such an eviction is a "lazy" one and can happen any time after an hour since the last update happens; the only guarantee Coherence provides is that entries that exceed one hour are not returned to a caller. The following backing map is an instance of com.tangosol.net.cache.SerializationCache which stores values in the extended (nio) memory and has a capacity limit of 100MB (100*1048576). The conventional backing map implementation contained entries for all partitions owned by the corresponding node. (During partition transfer, it could also hold "in flight" entries that from the clients' perspective are temporarily not owned by anyone). Figure 13-2 shows a conceptual view of the conventional backing map implementation. A partitioned backing map is basically a multiplexer of actual Map implementations, each of which would contain only entries that belong to the same partition. Figure 13-3 shows a conceptual view of the partitioned backing map implementation. This backing map is an instance of com.tangosol.net.partition.PartitionSplittingBackingMap, with individual partition holding maps being instances of com.tangosol.net.cache.SerializationCache that each store values in the extended (nio) memory. The individual nio buffers have a limit of 50MB, while the backing map as whole has a capacity limit of 8GB (8192*1048576). Again, you must configure a backup storage for this cache being off-heap or file-mapped. The Elastic Data feature is used to seamlessly store data across memory and disk-based devices. This feature is especially tuned to take advantage of fast disk-based devices such as Solid State Disks (SSD) and enables near memory speed while storing and reading data from SSDs. The Elastic Data feature uses a technique called journaling to optimize the storage across memory and disk. Elastic data contains two distinct components: the RAM journal for storing data in-memory and the flash journal for storing data to disk-based devices. These can be combined in different combinations and are typically used for backing maps and backup storage but can also be used with composite caches (for example, a near cache). The RAM journal always works with the flash journal to enable seamless overflow to disk. Caches that use RAM and flash journals are configured as part of a cache scheme definition within a cache configuration file. Journaling behavior is configured, as required, by using an operational override file to override the out-of-box configuration. Journaling refers to the technique of recording state changes in a sequence of modifications called a journal. As changes occur, the journal records each value for a specific key and a tree structure that is stored in memory keeps track of which journal entry contains the current value for a particular key. To find the value for an entry, you find the key in the tree which includes a pointer to the journal entry that contains the latest value. As changes in the journal become obsolete due to new values being written for a key, stale values accumulate in the journal. At regular intervals, the stale values are evacuated making room for new values to be written in the journal. The Elastic Data feature includes a RAM journal implementation and a Flash journal implementation that work seamlessly with each other. If for example the RAM Journal runs out of memory, the Flash Journal automatically accepts the overflow from the RAM Journal, allowing for caches to expand far beyond the size of RAM. When journaling is enabled, additional capacity planning is required if you are performing data grid operations (such as queries and aggregations) on large result sets. See Oracle Coherence Administrator's Guide for details. A resource manager controls journaling. The resource manager creates and utilizes a binary store to perform operations on the journal. The binary store is implemented by the JournalBinaryStore class. All reads and writes through the binary store are handled by the resource manager. There is a resource manager for RAM journals (RamJournalRM) and one for flash journals (FlashJournalRM). Lastly, journaling uses the SimpleSerializationMap class as the backing map implementation. Custom implementation of SimpleSerializationMap can be created as required. See Oracle Coherence Java API Reference for specific details on these APIs. The <ramjournal-scheme> and <flashjournal-scheme> elements are used to configure RAM and Flash journals (respectively) in a cache configuration file. See the "ramjournal-scheme" and the "flashjournal-scheme" for detailed configuration options for these scheme types. To configure a RAM journal backing map, add the <ramjournal-scheme> element within the <backing-map-scheme> element of a cache definition. The following example creates a distributed cache that uses a RAM journal for the backing map. The RAM journal automatically delegates to a flash journal when the RAM journal exceeds the configured memory size. See "Changing Journaling Behavior" to change memory settings. To configure a flash journal backing map, add the <flashjournal-scheme> element within the <backing-map-scheme> element of a cache definition. The following example creates a distributed scheme that uses a flash journal for the backing map. The RAM and flash journal schemes both support the use of scheme references to reuse scheme definitions. The following example creates a distributed cache and configures a RAM journal backing map by referencing the RAM scheme definition called default-ram. Journal schemes can be configured to use a custom map as required. Custom map implementations must extend the SimpleSerializationMap class and declare the exact same set of public constructors. To enable, a custom implementation, add a <class-scheme> element whose value is the fully qualified name of the custom class. Any parameters that are required by the custom class can be defined using the <init-params> element. The following example enables a custom map implementation called MySimpleSerializationMap. A resource manager controls journaling behavior. There is a resource manager for RAM journals (RamJournalRM) and a resource manager for Flash journals (FlashJournalRM). The resource managers are configured for a cluster in the tangosol-coherence-override.xml operational override file. The resource managers' default out-of-box settings are used if no configuration overrides are set. The <ramjournal-manager> element is used to configure RAM journal behavior. The following lists provides a brief summary of the defaults that are set by the resource manager. See "ramjournal-manager" for details on all settings that are available and their defaults. A flash journal is automatically used if the binary value setting, or memory setting, or both are exceeded. The <flashjournal-manager> element is used to configure flash journal behavior. The following lists provides a brief summary of the defaults that are set by the resource manager. See "flashjournal-manager" for details on all settings that are available and their defaults. A journal is composed of up to 512 files. A journal is thus limited by default to 1TB, with a theoretical maximum of 2TB. The directory specified for storing journal files must exist. If the directory does not exist, a warning is logged and the default temporary file directory, as designated by the JVM, is used.